Definition of control: restrain or limit something: to limit or restrict somebody or something. Never allow someone to silence your voice! Yes, it has been a rough weekend and yes, I am in a funk! But, like the song says, "The sun will come out, tomorrow....!" "When I'm feeling blue, all I have to do, is take a look at you...."
I'm so sorry to hear you had a bad weekend! And I can see why that little guy would cheer you up. (or girl) I just want to smile looking at the picture! I always say when I'm in a funk, Thank goodness I have these kinds of days because it makes me appreciate the Great days. So I say just enjoy your funky day! 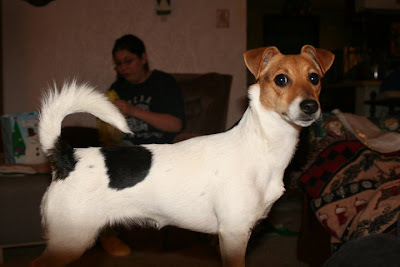 Awww I finally see your JRT in picture.. Hope you feel better now A.Marie.. I hope things are going better for you now! The kids went back to school on Monday so things are slowly getting back to normal! YAY!